The homeowner knows how she likes to live and surrounds herself with beautiful things that make everyone who steps into her home feel welcome. She invited me to design the interior architecture to create her vision of a timeless Louisiana French elegant mansion. I created rustic timber headers at the room openings and floors that mix stone and wood. An elegant Tiffany acorn light graces the foyer. 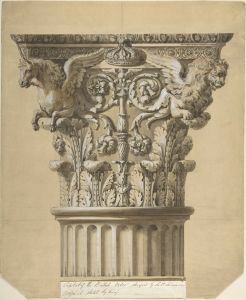 All furnishings are by the homeowner and her decorator, John Ashley. New Orleans is like stepping into a delicious, eclectic European fairy tale. For this home, the architect gave us a blank box. 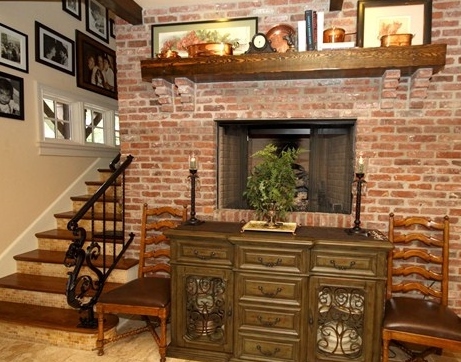 I created a high reclaimed brick fireplace in the family dining area of the kitchen, to feel like a fireplace that someone in the past might have cooked the family meal. If you look closely, you can see the hand wrought iron dragon stair newel. There is a wine cellar on the opposite side of the fireplace, tucked under the stair and facing the parlor. It’s always enjoyable discovering new finishes with a homeowner. one of our services it taking our clients to granite and marble yards, cabinetry shop, stone shops, brick yards, lighting showrooms, tile showrooms, stone showrooms, appliance showrooms and more. Together we select all of the elements that create the look and feel of the built home. 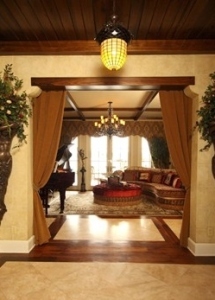 Classical Home Design, Inc. designs all of the elements that make a home feel wonderful before the furnishings come in. 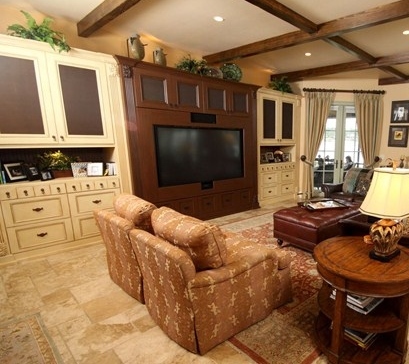 Media Wall Built-In Design: French Country Style Home, Orlando; Custom designed all cabinetry and layout. In the family room, I custom designed the media wall to look like re-purposed French cottage furniture pieces. The ceiling was kept simple with small timber beams that worked with the non-symmetrical geometry in the room. 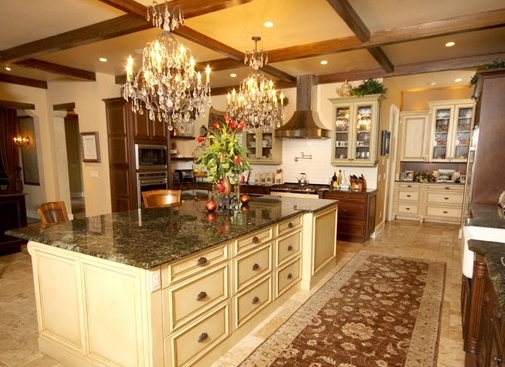 Classical Home Design, Inc. designed all of the interior architecture, cabinetry, wall and ceiling details. 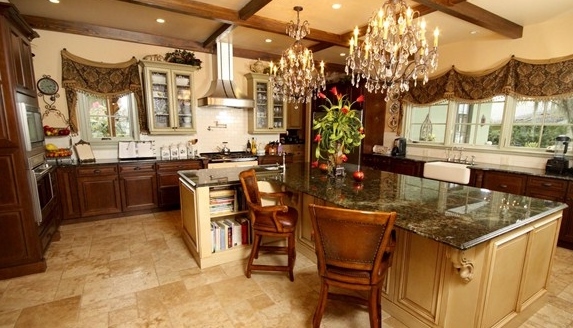 Kitchen Design: French Country Style Home, Orlando; Custom designed all cabinetry and layout. 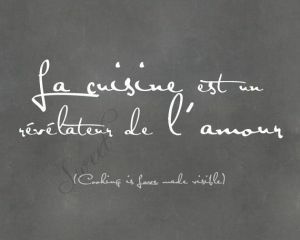 When it came to the kitchen, it was all about fabulous cooking and family. 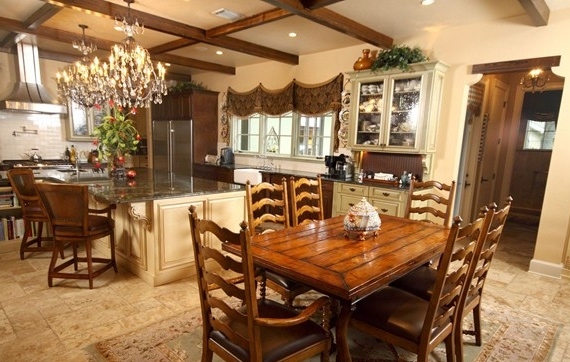 I custom designed all of the cabinetry to reflect antique hutches and furniture. Notice the soft green hutch at the end. It creates a transition between the working space and the living space. Three different cabinet door styles and finishes are used to create the look. You’ll notice that the hutch piece has a wooden counter top with green granite on the island. The homeowner, selected all of her furnishings, accessories, and draperies with the family decorator, John Ashley of Windemere. There is a large walk-in pantry behind the stove. At the end of the hallway, I designed another hutch display piece to look like a piece of antique furniture. All of the cabinets are trimmed with crown molding, with enough space above for accessories. Across from the stove, there is a prep sink and area for preparing food. 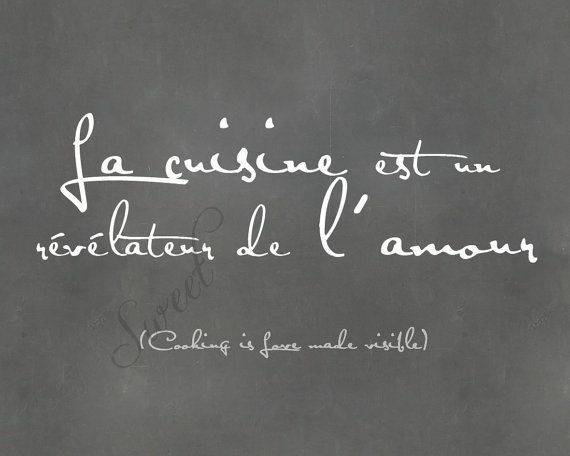 The large center island is for baking. The panels below the stools are operable cabinets for maximum storage. Did you notice the cookbook shelf? The large window over the sink faces a courtyard for the family dogs so that they can be safe from the creatures by the lake. 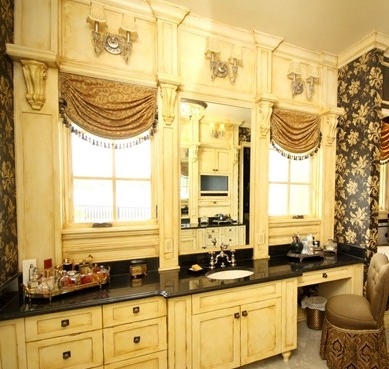 Custom French style vanities were designed to frame the windows that view the lake. This is the “Hers” side. The mirror reflects His side and a TV. The tiny dressing area is for balance. A lady who enjoys this much beauty deserves a huge luxurious dressing area hidden in her closet. Classical Home Design, Inc. always enjoys being part of a design team that creates a home that reflects our client’s true personality. Sometimes we design the entire home and other times we are just a key player in creating the vision. Please give Susan Berry a call or text her to discuss your home design vision. Susan @ 407-310-3663 cell. You may contact us by email to set a time for a consultation.